Gotz 50cm doll Hannah Loves Horse-Riding, has very long brown hair with a fringe, brown in-set eyes, long dark lashes and blushed cheeks. She has a fully articulated head and limbs, so her body is very expressive. Her asymmetry make her just like a real girl. Her feet are shaped on the underside and her knees are different to each other, with one leg slightly bent and knee facing inwards. 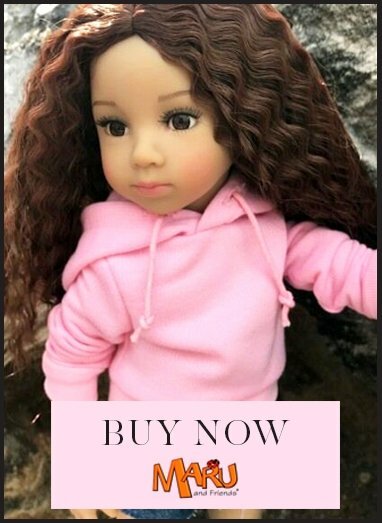 Gotz moulds are designed with a degree of asymmetry to make dolls look more real, as a reflection of the fact that in reality people are not symmetrical. Her brown hair is very long and of exceptional quality for lots of styling in play. She has dark fibre eyelashes framing her eyes on her upper lid. Hannah is wearing a black hard horse-riding hat, long riding boots which her grey jodhpurs are tucked into and a cosy pink satin gilet to keep our the chill as she attends to her horse. We love the pink stripe down the outer side of her grey jodhpurs which make her one of the more co-ordinated horse-riding dolls we've seen! She carries an accessory bag full of grooming utensils. A Gotz horse would make a perfect companion for this doll and the horse-loving child. Hannah's hair can be cared for by the My Doll Best Friend brush, chosen for its detangling effectiveness whilst being gentle on the hair. No knickers are worn by the doll, but they can be purchased separately. Clothes for Hannah are XL.